Vashon Tea Shop draws me back again and again. I like the quiet, and the beauty of the place. 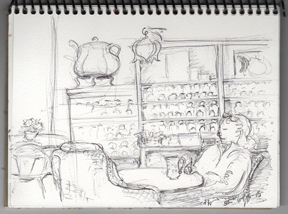 the places people hang out on Vashon, so I wandered into the coffee shop, Cafe Luna, thinking I would sketch there. Too crowded and noisy, so here I am back at the tea shop. Today the few people here want quiet too. They are planning, writing, thinking. I take out ...Oh no! forgot my watercolor paints and palate again! Luckily I do have a ball point pen and sketch book. Drawing more detail and contrast near the person writing focuses attention on her, and the darks on the big teapot--yes, it really is that big!--create a balanced composition. About her nose....no, she didn't wiggle it. She turned her head as I was drawing it.